The back (so far) of my KAL sweater. I got a good chunk of this worked on this weekend (yay! ), but I still have about forty something rows left on the back before I start the shaping for the armholes. This is only the first piece. Sigh. It's okay, I have resigned myself to the fact that I will be working on this long after the actual KAL blog posts have wrapped up. The beauty of Lion Brand's KALs is that they don't actually have a set schedule or anything. They do a post a week that you can use to pace yourself, but the discussion groups in Ravelry stay active as long as anyone is still working on the project and wants to talk about it, and the blog posts themselves don't go away. They will still be there to reference when I get to the steps they describe. I am so glad I went with the Wool-Ease for this project, too, because I really do love this yarn. Also, it was lovely to play with this past weekend, which was nice and cool and rainy for us. A rare treat. Yes, I know, it's October, that's the normal weather for everyone--unless you live in Texas. We don't really get fall. We just have summer (with a few fall-like days scattered throughout September and October if we're lucky) until winter shows up sometime in November. You get used to it, but still, after a summer like this one, breaks in the weather are very much appreciated. Right now I have six projects on my official knit/crochet list. Three of them are the current WIPs. One of them is a Christmas present that I am hoping will work up quickly in December. Another is a little quickie project for a friend that I can probably get done in a weekend, I just await measurements for that one. The third is a wedding present for someone who has actually been married for a few years already (I recently realized I totally dropped the ball on that), so while I would like to get it done sooner rather than later, there isn't really any sense of urgency to it. I am just crazy enough that, depending on how the Christmas present goes, I might even try my hand a knitting a pair of socks for my daughter's stocking. We will have to see on that one though. Wear these brightly striped socks whether you are going to the office or traveling through time and space. 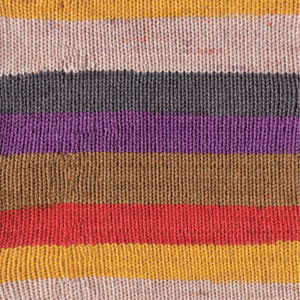 Time Traveler is a colorful mix of purple, tan, red, gold, ivory, and gray stripes. While you can knit some really really long socks, this colorway will not create socks that are larger on the inside than they appear on the outside. Knit Picks Felici in "Time Traveler"
What, I ask you, what? She buys six skeins of it, that's what.